Sidestep subpar airflow with Metallic Products’ round gravity vents. This versatile roof vent is designed for economic, low-volume air movement, and is perfect for ventilating warehouses, light industrial buildings, attics, lofts and other buildings requiring gravity or relief ventilation. Control the volume of gravity air movement with the adjustable damper, which is also effective in controlling water intrusion from wind-driven rain and backdraft conditions. 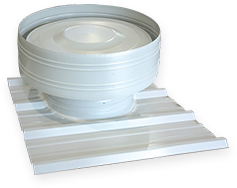 Standard round gravity ventilators are available in 12”, 20” and 24” diameter throat sizes. Other sizes up to 48” are available through special order. The damper is supported in the open position by four strong springs and is closed by a 5’ pull chain. Longer lengths are available upon request. Damper may be locked in any position by using the optional key type chain lock. Ventilator may be furnished without damper if desired, however, overspray or driven rain may enter the vented space. Ventilator with damper may function as a smoke exhaust vent by including a fusible link in the chain operator. 26-gauge inner and outer bands, rain shield and base are assembled with four pre-formed baffles into a simple yet sturdy ventilating unit. This design achieves a free, unobstructed flow of ventilated air. Assembly requires the installation of a 4 x 4 bird screen in the opening, between the inner band and rain shield, to prevent birds from entering the vent area. Galvalume finish is standard, Polar White and other colors — including Kynar® — are available. Base is specifically designed for final installation with specified roof slope — either ridge or single slope, and either flat or mounted into the specified roof panel. Base and ventilating unit arrive preassembled, ready for installation. Single-slope bases mount directly to the roof panel and are placed in such a way as to prevent damming. NOTE: When ordering, please specify roof slope, base type, damper pull chain and paint color.